Samsung Galaxy Note 4 is an amazing device and there are thousands of features packed into this superphone. Some of the features found in this device is a Air View and Air Gesture. Air View lets you interact with your device’s screen without actually touching it. Your device will detect when the S Pen or your finger is within about a quarter-inch of the screen and provide you an array of information about the content you are in proximity to. Air View lets you preview messages, emails, and other information; view scenes or the time elapsed in a video or movie timeline; see which contact has been assigned to a speed dial number; or magnify webpages. Air Gestures will let you navigate by waving your hand. Instead of swiping your finger from picture to picture in your gallery, you can wave your hand instead. You can even answer your phone without picking it up. You will find quick on/off toggles for both Air View and Air Gestures in your notification pull down, but you might need to fine tune the settings a little. 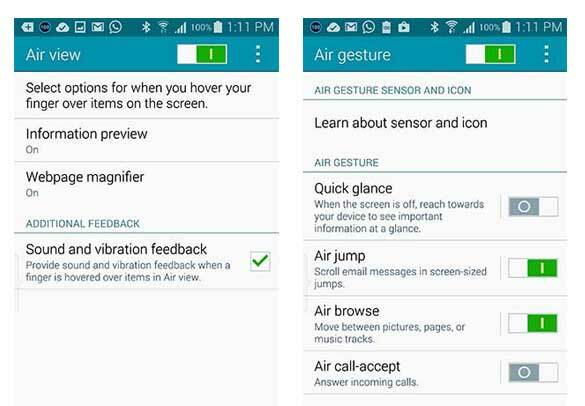 Below is how to enable the Air View and Air Gesture without root on your Galaxy Note 4. Install Nova Launcher from the store launch it. find Air gesture – long press – turn it on from the options. Press back button to comeback to settings menu to find AirView.